Every year at our family reunion we have a corn hole/bean bag tournament. The final two teams then play a ‘surprise’ game for the final round to determine the champions for that year. This year’s surprise game was Crokinole. Materials: Walnut, Sycamore, Jatoba, Oak dowels, Poplar pucks, rare earth magnets. Finished with several coats of General Finishes High Performance poly. A fun time for all and the champions (two on a team) each went home with a Crokinole game as a prize. Nice board Horky ! Great work. I like the disc holder. 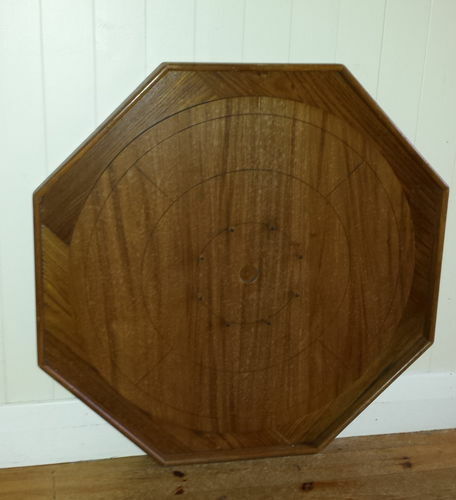 I have been teaching my 7 year old Grandson how to play here at the cottage on the board his great Grandfather made. I sell a junior plan out of plywood, and plan on doing the same for the larger solid wood board.